Passing the West Virginia written exam has never been easier. It's like having the answers before you take the test. If you're a new West Virginia driver, you won't need to complete a Driver's Ed course, but you will need to satisfy the requirements of the West Virginia Department of Transportation (DOT) graduated driver's licensing (GDL) program. Though not required, taking a driver's education course can help you ace your DMV written permit test and driving tests. Completing a Driver's Ed course will also waive the required supervised driving hours when applying for your first driver's license. You'll also likely be better prepared to face the challenges and responsibilities of a new driver. 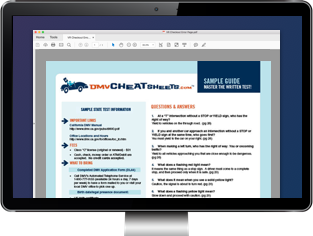 On this page, you'll find information about the steps you'll need to take to get behind the wheel with your first unrestricted driver's license in West Virginia. The West Virginia Department of Transportation's GDL program applies to all new drivers who are younger than 18 years old. You can start the program once you turn 15 years old by applying for your learner's permit. If you don't have access to a professional driving school/driver's training program in your area, you may consider enrolling in a Driver's Ed course online. Online driver's education courses allow you to complete the program at your own pace at the most convenient location for you. West Virginia traffic laws and violations. Reacting properly in hazardous situations. Sharing the road with other motorists. Developing good driving attitudes and behaviors. Your responsibilities on the road. Before applying for your learner's permit and taking the DMV written permit test, you should study the West Virginia Driver's Handbook. To learn how to obtain your learner's permit, please visit our Drivers Permits in West Virginia page. Are accompanied by a licensed driver who is at least 21 years old. Drive between 5 a.m. and 10 p.m.
Do not use your cell phone. Practicing with your learner's permit will help prepare you for your West Virginia DMV driving test and move on to the next step of the GDL program. Hold your learner's permit for at least 6 months. Have committed no traffic violations for the 6 months prior to your application. Complete at least 50 hours of supervised driving (including 10 hours at night) and submit a 50-Hour Certificate Log for Driver's License Applicants Under Age 18 (Form DMV-10-GDL), OR complete a Driver's Ed course. For more information, please see our Applying for a New License (Teen Drivers) in West Virginia page. West Virginia driver's license applicants under 18 years old use this form to log the amount of practice driving hours completed.